This is one of the funniest pictures! First, you can tell he isn't crazy about his antlers. Secondly, you can tell he isn't crazy about cameras. Lastly, you really only see him from the chest up with his legs out so he looks like a deformed Corgi. For some reason the insert image doesn't want to work! 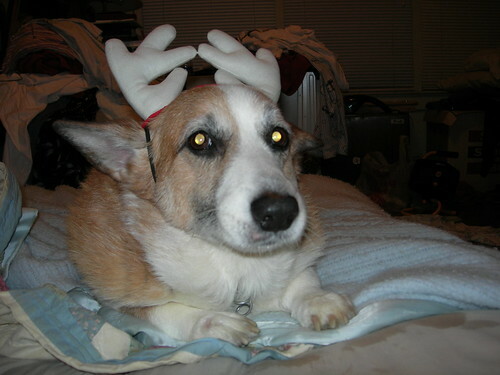 I wouldn't wear those antlers either! If I asked nicely, you might. With him I don't ask.